We have added a page under the Documentation tab that contains user documentation for the LibApps in the LibX Core Package. Here is a link to that page. The Book Vendors package of LibApps includes LibApps that work on the Amazon and Barnes and Noble sites. On the item’s page, these LibApps link the user to their library’s search catalog’s results for the item. If the edition uses Summon as its primary search catalog, the edition will also be able to utilize LibApps that display the item’s availability in the edition’s library directly on the page. The LibX Core Autolinking LibApps package includes LibApps that link a page’s DOIs, ISBNs, ISSNs, PMIDs, and RFCs to the library’s search result for the corresponding resource- provided that the primary search catalog is Summon. The Full-Text Linker package of LibApps insert Full-Text URLs in the web-content of journals in ACM Digital Library, IEEExplore, and Nature.com. The Process COinS LibApp, which finds OpenURL COinS on a page and inserts a cue that will link users to the library’s search for that COinS’ resouce, is also documented. 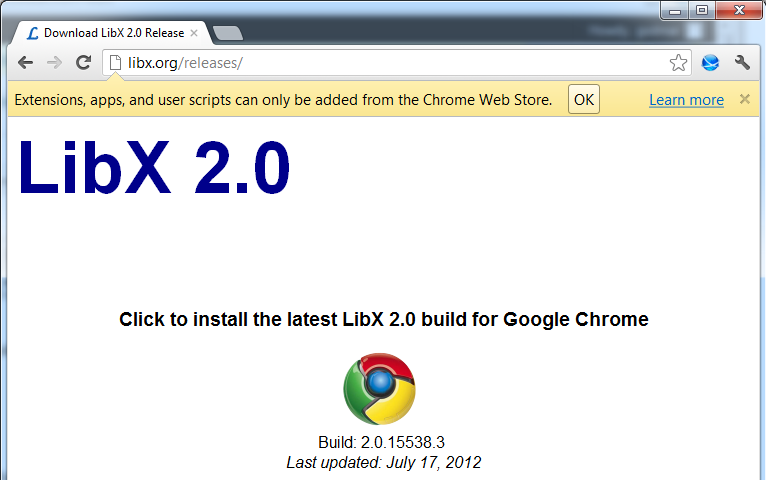 Update 10/4/2012: LibX is now in the Chrome Webstore! If a user installs directly from the webstore, they won’t have an edition activated. To ensure that your users will activate your edition upon install, follow these instructions. Update 10/3/2012: We are really close to making LibX for Chrome comply with manifest v2, expect it to appear in the web store soon. Ironically, after we were 90% done with the necessary changes – converting from the eval-based JsPlate to the eval-free AngularJS framework, Google reneged on their prohibition of eval() – it will be reallowed in future versions of Chrome. LibX for Chrome is currently broken, and it’ll take a long time to fix it. Use LibX for Firefox instead. Google really took us by surprise. The changes to LibX to conform to Chrome’s expectation would be tremendous, and at this point we cannot say how/if we can make them. Users then have to download the .crx file, save it into a folder, and then drag-and-drop it into the extension tab, as described under “Steps on adding extensions from other websites“. Obviously, this is an unsatisfactory situation. We are currently investigating whether it is possible to make LibX available via the Chrome Web Store.